I am writing this article to answer the question for establishing the trunking between a Cisco Catalyst Switch and a 3Com Super Stack Switch in ITKE community. 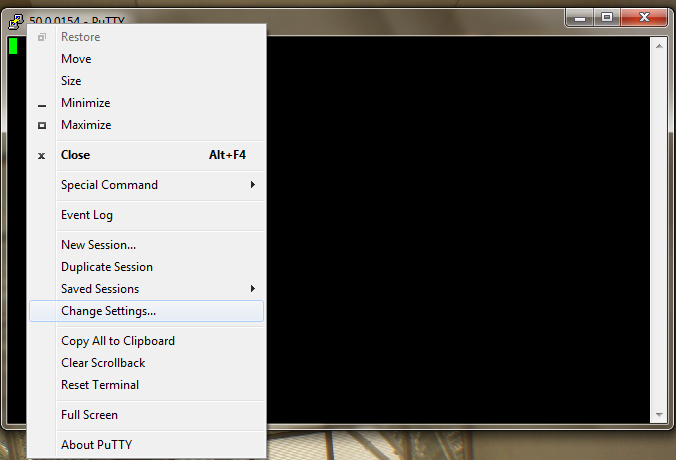 The goal of the article is show the user how to configure an inter operable trunk port in both Cisco and 3 Com Switch. As far as trunking concepts are concerned I did posted an article in ITKE blog comparing the HP Procurve and a Cisco Catalyst Switches which help to understand the trunking methodologies applied in 3 Com and Cisco Switches. In order understand the configuration process easily I present a scenario, based on this scenario we will configure the Cisco and 3 Com Switches to meet the objectives. · A Cisco Catalyst Switch is connected to a 3-Com Super Stack 4200 Switch (3-Com Super stack 3300 configuration is also available as the configuration process defers in a 3300 Switch)) using a port fast /Giga Ethernet 1 in both the Switches. · Create two VLANS locally in both the Cisco Catalyst Switch and a 3-Com Super Stack 4200. 1. VLAN 100 – For Workstations (named PCS). 2. VLAN 200- For Servers and Management Devices (Named MANG). · Configure fast Ethernet 0/1 on both the Cisco Catalyst Switch and a 3-Com Super Stack 4200 as 802.1 q trunking port. 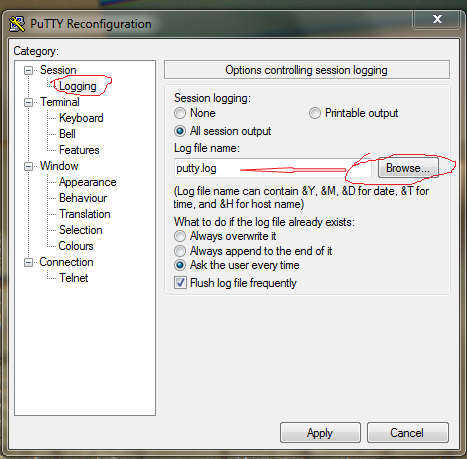 Task 2 – Configure the port fastethernet 0/1 as 802.1 q trunk port. Task 3 – Configure the ports fastethernet 0/5 for VLAN 100 and fastethernet 0/10 for VLAN 200. 3-Com Super Stack 4200 Switch Configuration Example (Configuration steps are as per the 3-Com Advance configuration manual – not tested). Create VLAN 200, and add GigabitEthernet1/0/10 to VLAN 200. Task 2 – Configure the port Gigaethernet 1/0/1 as a trunk port. 3-Com Super Stack 3300 Switch Configuration Example. If you are having an Organization with 100 employees or less and you are looking for an appropriate Security device to protect your Organization from the frequently growing internet threats, also offering secured wireless, offering Virtual Private Network (VPN) services to remote branch offices and on to go employees, with a firewall and optional email and web security capabilities. Here is the answer, the Cisco SA 500 Series Security Appliance. Cisco Systems recently launched the Cisco SA 500 Series Security Appliance recently exclusively for Small to Medium size business. The Cisco SA 500 Series Security Appliance comes in three models; SA 520, SA 520 W and SA 540, each of these models features the integrated firewall, support for the Trend Micro ProtectLink Gateway and network ports which are capable of working at 1 Giga Speed. Here are some of the features of the Cisco SA 500 Series Security Appliance. Only SA 520 W is capable of supporting Wireless (802.11 b/g/n capabilities) working in the 2.4 GHz range with high encryption capabilities. · Secure remote access to business information with a built-in stateful packet inspection (SPI) firewall and VPN capabilities. · Increased security of remote access: With support for optional VeriSign Identity Protection (VIP), the Cisco SA 500 Series provides two-factor authentication and one-time-use password access control. · Lower costs associated with deployment and management based on a single, easy-to-install, easy-to-use solution. · Prevent security breaches from email threats or malicious websites that could lead to disruption of business-critical applications and services. · Increased employee productivity by helping prevent spam, spyware, and inappropriate web browsing with the optional Trend Micro ProtectLink Gateway. · Easy deployment and management: The embedded Security Appliance Configuration Utility offers comprehensive configuration and monitoring of all the services in a single application. · Affordable service coverage: The highest level of performance and reliability to keep your business running smoothly. Check out Small Business Pro Service. In conclusion Cisco SA 500 Series Security Appliances is designed to solve Small business problems. For more information visit the Cisco SA 500 Website. In one of my older post in June I was just taking about the FCoE (Fiber Channel over Ethernet) as a standard. Cisco Systems was one of the major contributors to establish the FCoE Standard. 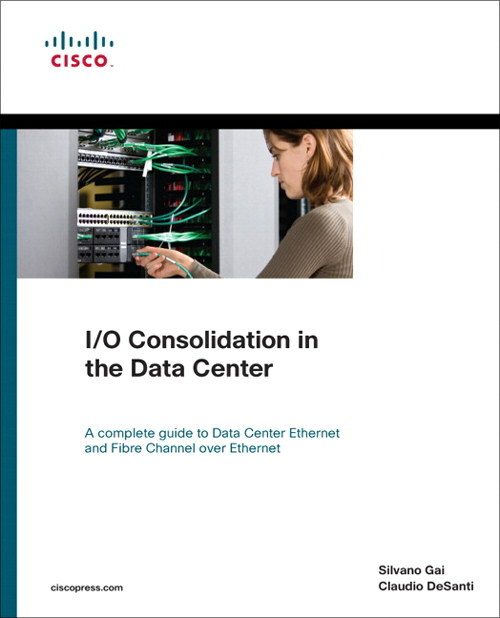 Like a responsible vendor now Cisco Press has come up with a new title “I/O Consolidation in the Data Center”. This title is a fully updated version of Silvano Gai’s privately-published book on FCoE, written for leading FCoE pioneer Nuova Systems before the company was acquired by Cisco. Nearly 12,000 copies of that book have already been distributed, demonstrating the immense interest in FCoE technology, and the scarcity of reliable information that has existed about it. The new title “I/O Consolidation in the Data Center” deals with the recently approved FCoE standard. According Cisco Press Senior Publicist Jamie Adams the new title comprises of five detail case studies illustrating typical FCoE adoption scenarios, as well as extensive Q & A section addressing issues raised quite often by the Enterprise IT professionals. For more details do check out the Cisco Press product description. Recently I was browsing a press release from Microsoft about the thinnest keyboard ever available, which is slightly thicker than an AAA battery. The newly designed keyboard is exclusively for Bluetooth computers, and Microsoft called this keyboard as Mobile Keyboard 6000. The Mobile Keyboard 6000 comes with a ‘Comfort Curve’ that gives your wrists a rest with a slight 6-degree curve. While it might not seem like a big deal, Microsoft has already sold more than 10 million of its Comfort Curve keyboards so there’s definitely a wrist-concerned market out there. One more unique feature of Mobile Keyboard 6000 is number pad can be separated and used separately. Microsoft will be selling the Mobile Keyboard 6000 next month for $89.95. But if it’s just the Number Pad you’re after, you’ll need to spend $44.95. I am always inspired by the Cisco Press books which are my only source for my career success. When it comes to certification study guides, Cisco Press leads from the front. In this article I will try to review the CCNP BSCI Official Exam Certification Guide, Fourth Edition, this study guide is a first and final step towards your CCNP success. As promised by Cisco Press the CCNP BSCI Official Exam Certification Guide, Fourth Edition, is indeed a best breed of Cisco® exam study guide which specifically focuses on the objective of CCNP BSCI 642-901 exam. The study guide comprises of over 600 pages divided into 21 chapters. Which covers essential routing principles, EIGRP, OSPF and IS-IS in dept as well as basic BGP configuration. The study guide has concentrated a bit more on Multicasting and multicast routing and the IPv6 is explained well but not in too dept. The best part I liked about the CCNP BSCI Official Exam Certification Guide, Fourth Edition, is the Cisco IOS® routing features. The CCNP BSCI Official Exam Certification Guide, Fourth Edition, comes with a companion CD from boson which consists of an electronics books and more than 200 practice questions which also included simulation-bases questions available in study mode, practice mode and flash card format. Some of the features which I liked most in the CCNP BSCI Official Exam Certification Guide, Fourth Edition, “Do I know this already?” quizzes and “Foundation Summaries” that start off each chapter. These allow the reader to assess what they already know about an upcoming section and what they need to focus on. The end-of-chapter “Q&A” will solidify any knowledge you have gained or need to review. Also the scenarios provided at the end of the chapters are worth from exam point of view. 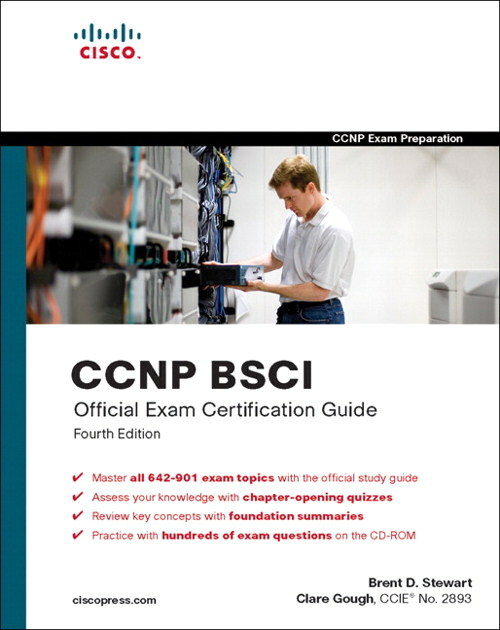 Overall a good supplement for the exam, but the CCNP BSCI Official Exam Certification Guide, Fourth Edition, cannot be a sole resource for the exam. It’s always good to use the resources available at the Cisco learning websites. Finally I would rate 4 out of 5 for this study guide. 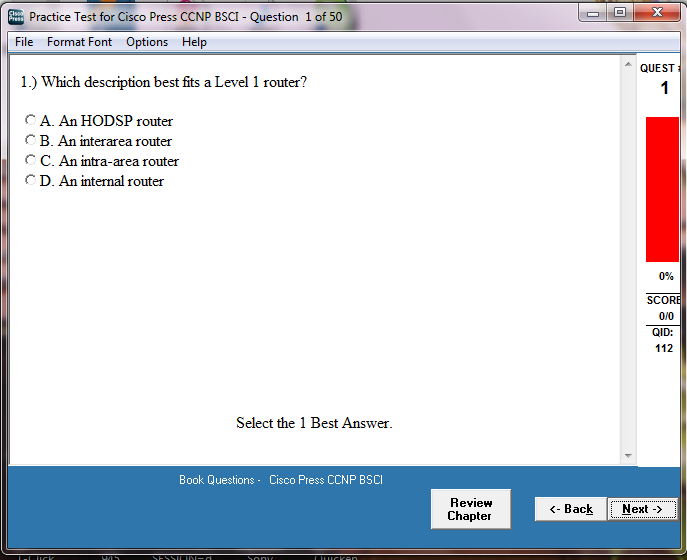 Better luck folks and hope to see you all passing the CCNP BSCI 642-901 exam at first attempt. Yesterday I received an email from the Area Manager Mohammed Fazal, of the leading Swiss cabling specialist, Reichle & De-Massari. 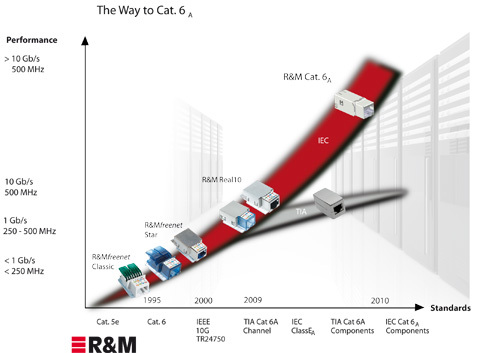 According to his email R & M unveiled a major breakthrough in copper cabling, a new RJ45 connection module which meets the Cat. 6A standard as specified by ISO/IEC had been launched. He also added that the new devices allow companies to boost their network’s bandwidth and transmission quality without having to abandon the reasonably-priced and reliable RJ45 connector standard. In a recently held Ineltec conference in Basel R & M unveiled the high speed RJ45 connection module. The R & M development lab has discovered a new way of shielding individual twisted pairs from electromagnetic interference and the company claims the new devices will be suitable for transmission of data at speeds greater than 10Gbps. Also check the press release from R & M.
The new research sponsored by Brockade and Eaton suggests still data centers are being driven by performance issues. According to the new study done tje by leading industry group, almost all Data Centers are cooled to a temperature lower than the required temperature for the normal operation of a Data Center. 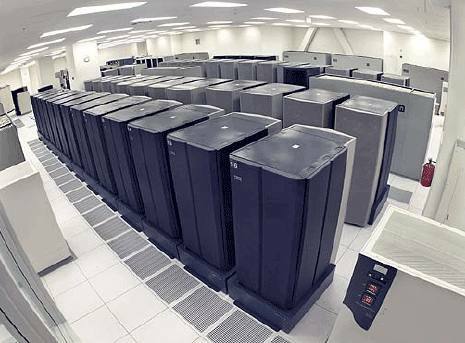 The group comprised of representatives Intel, IBM, Liebert, HP and the Lawrence Berkeley National Lab, found almost all Data Centers in a survey of the US Data Center Users Group were cooled much below temperature than the recommended temperature of 27°C. The recommended temperature for the Data Centers of 27°C was proposed by American Society of Heating, Refrigerating and Air Conditioning Engineers (ASHRAE). The study also estimates the potential energy savings that could be achieved if data centres could be operated closer to the recommended limit as being as high as 90% energy savings for CRAHs. We all work remotely with Cisco routers and Switches, we often do login to do some configuration changes in the Cisco routers and Switches. What if we configured wrongly in the live Cisco routers and Switches which are located in the remote sites, we don’t enjoy the liberty of resetting the devices unless we have control over the power distribution. to the device, then try back after 10 minutes as the device will get reloaded with the original startup-configuration which can helps us to restore the connectivity to the device. Once we are sure about the new configuration and its working properly without any hassles there is always a way “reload cancel” command is there to cancel the reload. I find this command to be very handy and useful especially when we have to telnet or SSH to remote Cisco router or a Switch. 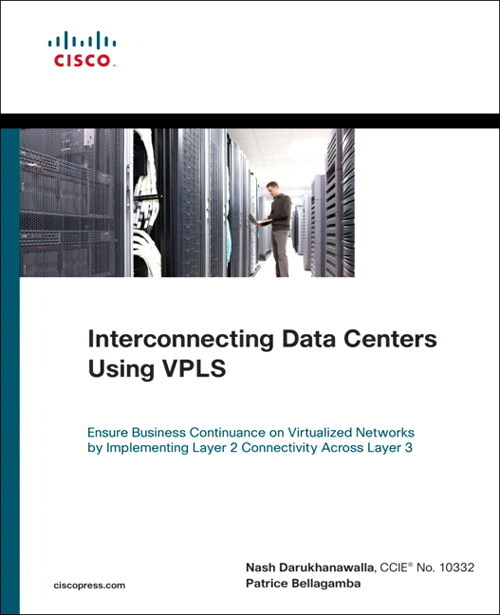 Interconnecting Data Centers Using VPLS is a book which aims at providing solutions that provide a high speed, low latency network and spanning tree protocol (STP) isolation between data centers based on Virtual Private LAN Service (VPLS). The book makes interesting reading, especially as it covers in detail about the architecture design and configuration required to interconnect data centers as well as case studies to interconnect Data Centers. This book is targeted to Systems professionals and System engineers who are into designing solutions for interconnecting data centers which ensures high availability Layer 2 connectivity and STP isolation. The authors Nash Darukhanawalla and Patrice Bellagamba started the book with explaining the need for high availability of the Data Centers, explaining the concept of the high availability clusters, introduction to Virtual Private LAN Service (VPLS), MPLS traffic engineering. The authors’ present different flavors of data center interconnect solution using different combination of Spanning Tree modes, VLAN mapping as well other criteria’s along with complete configuration required at the aggregation switches and provider edge routers. The book is divided into 13 chapters, and it also deals with issues related to layer 2 bridging domains and provides guidance to extend VLANs using Virtual Private LAN Service (VPLS). This book contains lot of reference network diagrams which can help the readers to understand the presented solutions in normal mode as well as in failover mode. I found this book extremely readable and enjoyable and I would recommend this book to the folks who are interested in knowing more about the Virtual Private LAN Service (VPLS). The book comes with lot of useful information which will definitely help the readers to get familiar with the Virtual Private LAN Service (VPLS) concepts and configuration steps required for interconnecting data centers.